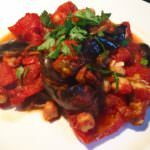 Replacing lamb mince with chickpeas and roasted red peppers in this twist on the original recipe, makes this Aubergine, Red Pepper and Chickpea Moussaka a fabulous midweek vegan/vegetarian supper and a great way to boost your fibre and nutrient intake. Cut the aubergine into large chunks or thick (2 inch) discs. Meanwhile, cut the red peppers into long 2 inch strips; toss each vegetable separately in olive oil in a large bowl and lay out on a (separate) baking tray taking care not to overlap. Roast the aubergines for 40 mins until soft and golden and the red peppers for around 25-30mins until soft. Set aside. In a saucepan, gently sauté the onions and garlic in olive oil until they are soft for around 5 mins. Add the spices, salt and pepper and cook for a further 5 minutes over a low heat before adding the tomatoes. Check seasoning. Bring to the boil and simmer over a low heat until the sauce has reduced and thickened – around 10 mins. Add the chickpeas and cook for a further 2-3mins. 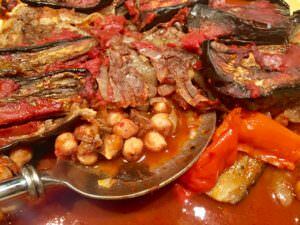 In a deep dish, arrange half the roasted aubergine and red peppers in a layer and spoon the chickpea/tomato mixture over the top. Repeat with a second layer. Drizzle with olive oil. Bake in a moderate oven (180) for 1 hour. Cover and allow to settle for 15-20mins if possible before serving. Serve with a rocket/watercress with feta salad on the side. Nutritionally, the vibrant purple colour is due to a group of antioxidants called Anthocyanins, which fight inflammation and scavenge free radicals. 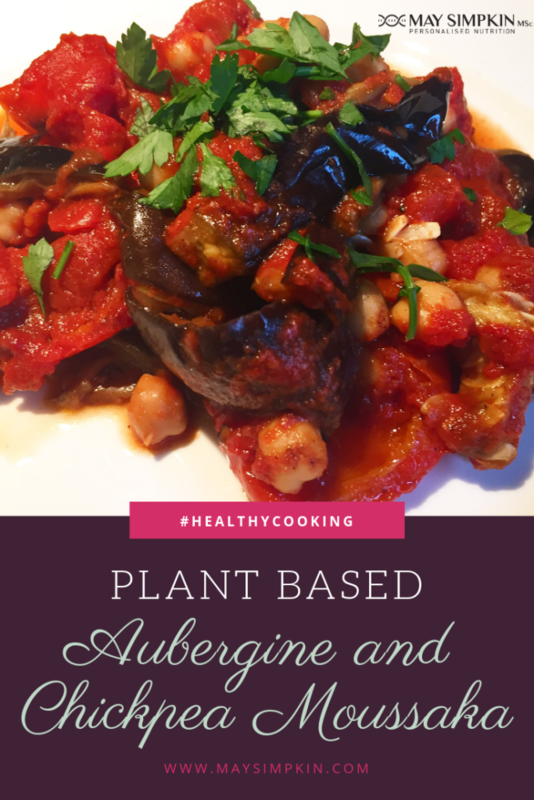 Very low in calories and fat, Aubergines are an excellent source of fibre, which helps to maintain a healthy digestive system and can potentially lower cholesterol. They are also a good source of B complex vitamins and minerals including iron, potassium, copper, magnesium and manganese. Lovely recipe which is a perfect match for the Val de Salis carignan which is £5.99 in Lidl.